One of the most versatile patio materials is poured concrete, because it can take any shape you like. It is also an appropriate base for other materials, such as glazed tiles. Just make sure it has adequate drainage to control storm water runoff. 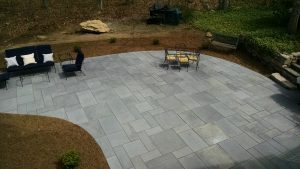 Irregular, naturally produced flagstone is one of the more popular patio materials. It comes in several colors and regional varieties, like Pennsylvania bluestone and Arizona sandstone. Flagstone can be difficult to work with, so it isn’t recommended that you install it yourself. A professional installer will also let you know what the maintenance requirements are, such as sealer to preserve color. Patio Materials 101 – know your stones so you can best maintain them. Reclaimed clay bricks are becoming increasingly popular both for their unique look and for their “green” appeal. Bricks go down easily on a bed of sand and can be used to create many different patterns. It’s also easy to replace individual bricks that crack over time. Patio pavers are popular patio materials because they come in a wide variety of forms, including some that mimic stone or clay. If you don’t opt for an interlocking design, make sure you ring your patio area with pressure-treated lumber so the pavers don’t spread. Hopefully this quick explanation of different patio materials has gotten you excited to start your patio project. Whether you opt for flagstone, brick, or concrete pavers, an experienced professional can help you get the look you long for in your yard.